Public Contact after Reply for Outlook (Public CAR for Outlook) is an addon for Microsoft® Outlook®, which automatically creates an Outlook contact after reply to an email. This function is supported in Outlook-Express but not in Outlook. In Outlook-Express you can find this function under "Options" as "Add addresses automatically to contacts after reply". Again, this is an addon for Outlook, not for Outlook-Express. SDMD developed this technically meaningful function for an Outlook Addon as Freeware. How can I add addresses in Outlook automatically to contacts after I reply to an email? Where can I find this function of Outlook-Express in Outlook? How often did you communicate with a contact? Are my Outlook contacts up to date? Do I have each e-mail address, that communicate with me, in my Outlook Address Book or in my Outlook contact folder? How can I save all my e-mail addresses automatically after I reply to an e-mail? Are all contacts completely stored in Outlook e.g. for a Newsletter? Public CAR for Outlook also supports the function "reply to all". If you have e-mails with several e-mail addresses in the "From" field, each of these E-Mail addresses will have a seperate contact created in Outlook. Public CAR for Outlook protects you from dupes. This addon will compare the existing e-mail addresses with the new one. No dupes are produced with this addon for Outlook, if it's regarding the same e-mail address. Public CAR for Outlook also scans additional Outlook contact files for already existing e-mail addresses. All e-mail addresses can be included in the scan. Public CAR for Outlook in additon supports the automatic storage of the contacts in Outlook and also the previous action of the contacts in Outlook. If you want to enter further contact information like street, company name etc, into the Outlook contact form, the contact form can be opened before storage. You can also naturally deactivate this function. Public Contact after Reply for Outlook supports all Outlook versions and Public ShareFolder, the Microsoft Exchange alternative. The settings are saved for every user and for each Outlook profile. For each Outlook profile you must create/provide your own configuration. Public Contact after Reply for Outlook is a helpful adddon for Outlook for all Outlook users, who want to have their e-mail addresses and their contacts in Outlook up to date. You lost a lot of contacts because there is no default automatically functioning in Microsoft Outlook to import the existing e-mail-addresses in Outlook or to save the e-mail addresses from the e-mail that you reply. This addon for Microsoft Outlook was developed by our day to day experiences. Now, every time we received e-mails, with this freeware addon for Microsoft Outlook, we can convert the addresses efficiently in Outlook. Now you can do it, too. (Outlook Express has a technical benefit. We hope that we eliminated this benefit with this addon for Outlook). Public Contact after Reply for Outlook supports also public contact folders of Public ShareFolder. Public Contact After Reply for Outlook is a freeware addon for Outlook developed by SDMD GmbH, Hamburg. 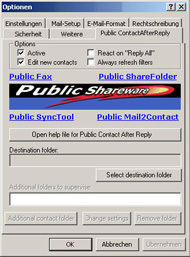 Public Contact After Reply for Outlook is Freeware. There are no costs for licensing. Note: We do not deliver technical support for freeware. You can open the manual of Public Contact After Reply directly in Outlook. The english version get an english manual. Minor problems with Outlook 2002 and 2003 were repaired. Errors in the automatic updating of the filters were repaired. Microsoft and the Office logo are trademarks or registered trademarks of Microsoft Corporation in the United States and/or other countries. All other product names are trademarks of their registered owners.